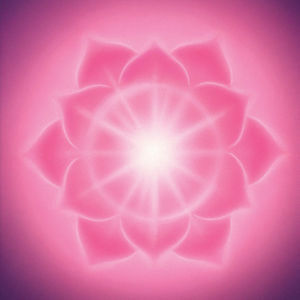 The most important chakra is the twelve-petaled heart chakra. From the heart chakra, the energy of life that has descended to you from your I AM Presence over the crystal cord and through the blessed mediator, the beloved Christ Self, is distributed to the other six major chakras and to the five minor chakras (of the secret rays), thence to all the cells and nerve centers in the four lower bodies. The heart is where the pink fires of love burn brightly. It is the seat of illumined conscience and the authority of God’s will that you make your own by love’s discernment and wisdom’s true discrimination. Your heart is a focus of the Great Central Sun. God made it so. When you keep the heart in the vibration of Christ’s love in compassion for all life, you discover all life as one. For out of the heart are the issues of all life that lead to the One Source. The Sanskrit name for this chakra is Anāhata. The magnet that you create within the heart chakra is the ascending triangle. And the more you meditate upon this triangle superimposed upon the heart chakra, the more it becomes the reality of the dimensions of the Sacred Trinity, embodied in the threefold flame sealed in the hidden chamber of the heart. As surely as the call compels the answer, so the presence of this forcefield, of this triangle, combined with the letters of living flame I AM THAT I AM will draw the descending triangle of God’s consciousness into the heart chakra. And the merging of Creator and creation through the intercession of the Christ Self is the foundation of our exercise whereby the aura of man becomes the aura of God. Kuthumi and Djwal Kul, The Human Aura: How to Activate and Energize Your Aura and Chakras, book 2, chapter 3. This page was last modified on 24 June 2016, at 08:00.